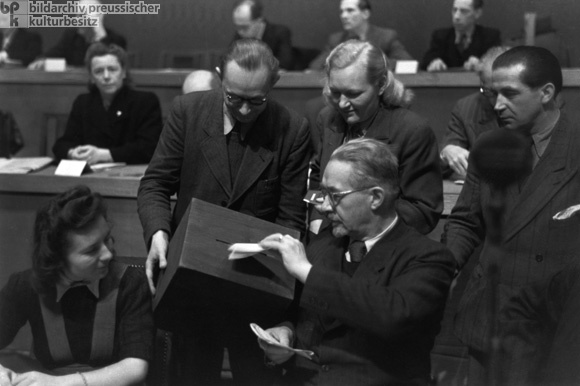 The Second German People’s Congress took place in East Berlin on March 17-18, 1948. In order to protest the likely founding of a state in the Western occupation zones, the Congress decided to petition for a referendum on German unity in all occupation zones in May/June 1948. The referendum was not approved in the Western zones, however. The Congress also convened a “German People’s Council” [Deutscher Volksrat], whose 400 members (300 of whom came from the Soviet occupation zone) claimed to represent all of Germany. The main task of the People’s Council was to draw up a constitution on the basis of a draft presented by the SED in 1946. After being put to public discussion in late October 1948, this revised draft was eventually accepted as the GDR constitution on October 7, 1949. This photograph shows one of the three chairmen of the People’s Congress, CDU delegate Otto Nuschke, who became CDU chairman in the Soviet zone in September 1948. From 1949 until his death in 1957, Nuschke served as deputy minister president of the GDR, as well as head of the Office of Religious Affairs.